If you own UAV (Unmanned Aerial Vehicle) or Drone such as DJI Phantom, Inspire and many others, you can turn your Drone into a powerful aerial surveying tool. There are many applications that can turn the pictures taken from the Drone into a georeferrenced images. But most of them are not free and sometimes they are too expensive for some of us. Pix4D for example, you will be charged for USD240 for a month rent. But don’t worry, the Open Source world has the solution for us to process and create georeferenced images taken from aerial vehicles (Drone). OpenDroneMap is an open source application developed by Daniel Schwarz (find the project on GitHub). OpenDroneMap will help us to create orthopohotos from pictures taken from Drone, Balloon, Kite and many others. With the current update, we are adding the ability to create orthophotos from drone, balloon, and kite imagery which has GPS ephemeris. 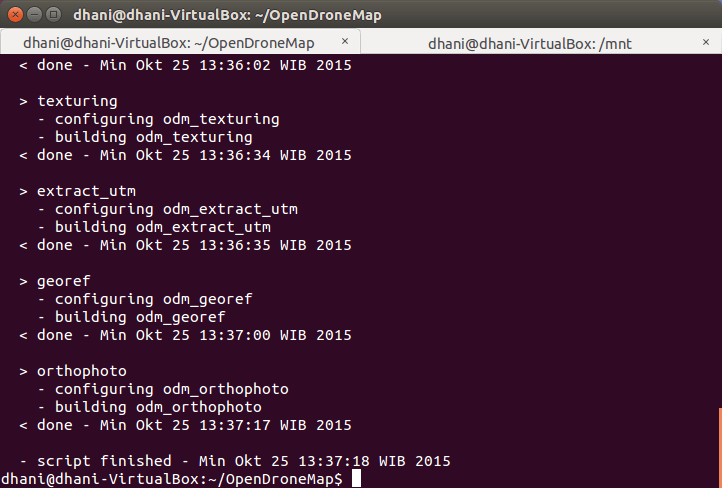 I will show you how to install OpenDroneMap on Ubuntu 15.04. Make sure you have a good internet connection since this will download many files from the internet. First, make sure you run Ubuntu 12.04 or later. I am using a fresh Ubuntu 15.04 on this tutorial. Then follow these steps: (most steps must be done from Terminal). Wait until the installation completed. The install process will take a long time (depends on your internet connection). If in some cases you got errors during installation, check the logs located inside OpenDroneMap directory and see what was wrong. Be patient, it took me about 1 hour of installation on my VirtualBox.